The BBQ Boys are a 4 piece Jazz, blues and jug band that has performed with many well known artists such as Jim Kweskin, Geoff Muldaur, Maria Muldaur, John Sebastian, David Grisman, Dan Hicks and Mary Flower. Originally the Barbecue Orchestra, it was started by famed washtub bass and jug blower Fritz Richmond (of the original Jim Kweskin Jug Band) and Turtle VanDemarr (guitar player with Dan Hicks and the Hot Licks). In 2008 Fritz passed on to jug band heaven and Turtle began playing music in his daughter’s band. The remaining members Stew, Spud and Doc added a sousaphone player par excellence, Mark. The BBQ Boys have played many concerts with Jim Kweskin and the Jug Band, in San Francisco’s Great American Music Hall, The Roots and Rhythm Festival in Providence,R.I., Club 47 in MA, The Waterfront Blues Festival in Portland,OR and The National Jug Band Jubilee in Louisville, KY. 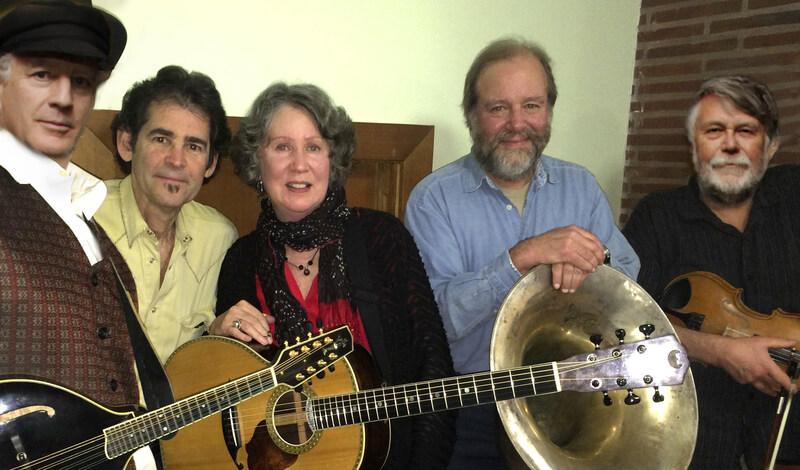 In 2013 they joined forces with Mary Flower as a jazz and blues infected jug band (sans jug) and have created new masterpieces of old standbys and originals adding rich harmonies and searing solos. Stew Dodge on fiddle and vocals. He is the owner and CEO of Stew Dodge Sound Co.
Spud Siegel on mandolin, mandola and vocals. He is a ship’s captain on the Columbia River. Doc Stein on dobro, guitar and vocals. He is an ER doc in his spare time. Mark Vehrencamp on sousaphone. He is a railroad engineer for Union Pacific who also plays with the Vancouver Symphony.